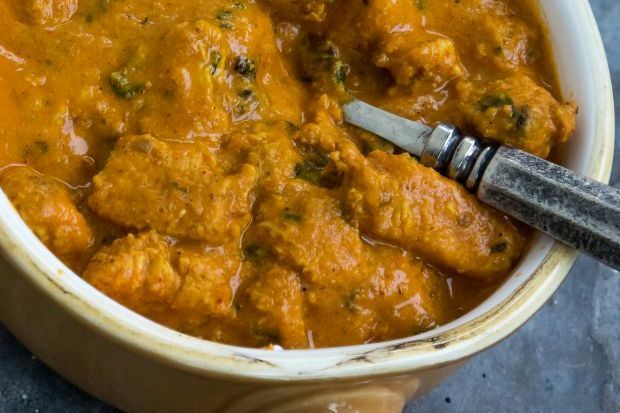 This recipe brings chicken curry to the next level by using the smoking technique. Nonetheless, the curry still stays true to its traditional elements. Chef Sapna Anand recently published a cookbook, New Indian Kitchen, which is available at MPH bookstores. She also conducts cooking classes at At 19 Culinary Studio where she shares her cooking experiences and techniques. She blogs at My Test Kitchen and has a FB page under the same name. Picture courtesy of Sapna Anand. Cut chicken into 2-inch cubes and marinate with ginger and garlic, lemon juice and salt. Set aside. To make cashew paste: Soak cashew nuts in warm water for a few minutes and blend into a smooth paste using 2-4 tablespoons of water. Boil tomatoes for about 5-7 minutes on high heat in a large pot of water. Peel the skin and blend into a smooth paste. In a large pan, heat the butter over a low flame and toss in the marinated chicken. Sauté on medium heat for about 12-15 minutes, stirring occasionally until the chicken is almost done. Add the tomato puree, turmeric powder, chilli powder and garam masala, and sauté for about 5 minutes. Add half a cup of water and cook on medium flame with the lid on for about 20 minutes, until gravy thickens and oil starts to bubble around the edges. Add the cashew nut paste and stir well for 10 minutes. Take the pan off the heat and stir in the cream. Heat a small piece of charcoal on a gas burner until red-hot. Place the hot coal in a clean metallic bowl. With the help of tongs, place the bowl with the charcoal over the curry in the centre. Pour half a teaspoon of ghee onto the charcoal and cover the pan with a lid immediately. Let it smoke for about 2-3 minutes while keeping the lid on. Opening the lid during this process will let smoke escape and dilute the smoky flavour. After it's done, remove the metal bowl. Garnish the curry with chopped coriander leaves.